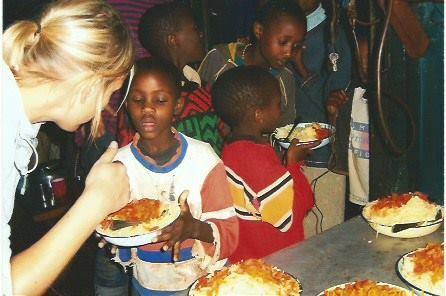 …10 years ago – KIDS Kenia e.V. and I travelled to Kenya for the very first time. At that point I never really thought that the trip will change my entire life. With that stay I easily wanted to know firsthand what it means to live in poverty. I read so many books about it, I watched movies and documentaries. Actually, I was fascinated by poverty. So, I made a journey to the so called Third World! (by the way I truly do not like that wording nowadays). The following months I spent with people they taught me in school to call The Poor. And lastly, I felt in love with the KIDS I met. They had so much hope, so many dreams and a great positivity about their future ONCE they can go to school and make a grade – one day – to become doctors, nurses, teachers, lawyers, pilots or tailors. We always tend to believe that poverty is only being hungry, naked and homeless whereby poverty of being unwanted, unloved and uncared for is the greatest poverty which no one teaches us in school (Thank you Mother Teresa). I truly committed myself to give out an helping hand to the ones who inspired me most – to the disadvantaged KIDS. I decided to take action and got motivated by the spirit of these amazing KIDS. To see them fighting the good fight every day was one of the quite considerable argument for my strong commitment. These KIDS deserve a chance in life like I always had one only caused by the simple fact that I was born in the so called First World. KIDS Kenia was born! …only because of the children! After 10 years, that fascinating place has become my second home and I love being a part of it. To advocate for the right to education and to fight against corruption has become my deep passion and my mission too. Some people may say its just a drop in the famous big ocean. Some people may say you can’t change anything in this world. Some people may just be prophets of doom and gloom. My closing message to those people: After all, I know that YOU can do something about poverty: It is called Education! But you have to fight for it and this is what I do. Because I am a fighter and not a quitter! Feel free to join us anytime because education is fundamental to a dignified life! So, get ready to rock! And never ever forget to smile, never ever let the world change your smile – they say you should use your smile to change the world, cheer up! And I fully agree to it 🙂 See yu soon!!! PS: It is said you better travel with someone you love. Double-Check! This I always did and I will always do!